More than 1,493 pounds of trash and recycling were collected Thursday during the Surfrider Foundation San Diego‘s annual post-Fourth of July beach cleanups, the nonprofit organization announced. More than 525 volunteers participated in the “Morning After Mess” events, held in collaboration with I Love a Clean San Diego and San Diego Coastkeeper at Ocean Beach Pier, Fiesta Island, Pacific Beach and Oceanside Pier. Those areas were chosen because of their high concentration of beachgoers and “notorious reputation” for post-Independence Day trash, according to Surfrider. Better habits, including less reliance on single-use plastics, could reduce the necessity to hold beach cleanups, said Mitch Silverstein, Surfrider San Diego coordinator. More than 8,000 cigarette butts and 1,535 plastic food wrappers were collected at local beaches Thursday, according to Surfrider. A few unusual items were found, as well, including a garage door opener and head massager. 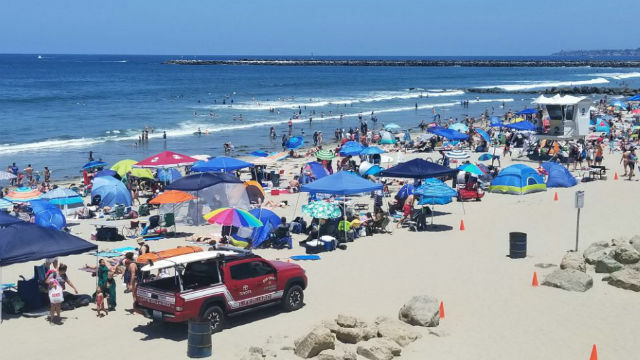 An estimated 322,500 people flocked to beaches in the City of San Diego on the national holiday, according to the San Diego Fire-Rescue Department.